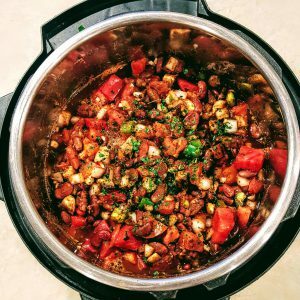 This recipe is made using the Instant Pot Pressure Cooker and cooking with dry beans, which takes about 3-4 hours. If you prefer to use a crock pot, stove top, or canned beans that is fine, too. Cook for about 7 hours in the crock pot or on the stove top. 8 oz pkg Chorizo-flavored seitan, thawed (or other meat-alternative); added at the last hour of cooking. Note: Seitan has gluten in it, so if you are sensitive to gluten you will want to substitute with another meat-alternative. Serve in a bowl, garnished with tomatoes, cilantro, diced green onions, or diced avocado, if desired. Note: The chili can also be made in the crock pot; just throw everything, except the seitan, into the pot. Add the seitan during the last 1 hour of cooking and heat through. For the best nutrition results, put some fresh chopped greens such as spinach or kale, in the bottom of your bowl and ladle the chili on top. Resist the urge to add sour cream or cheese, unless you use a vegan alternative.